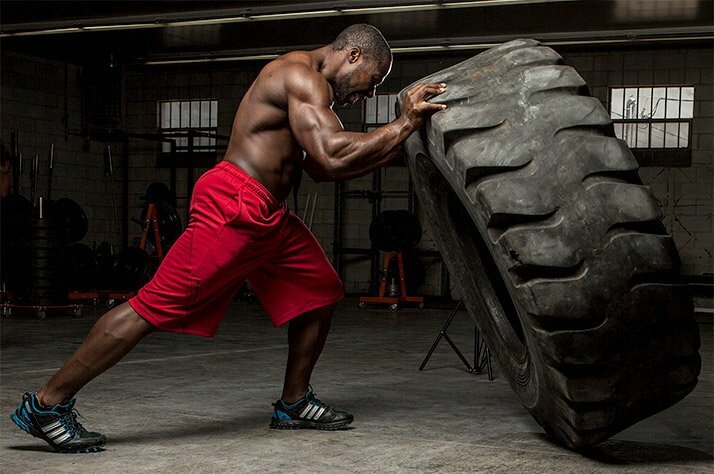 Tire flips look tough and demand every ounce of strength you can muster. They're definitely not for everybody, but if you earn the right, your reward will be a new level of power and athleticism! Back in 2002 or 2003, I was an aspiring strength coach with what seemed like a big problem. The "functional training" craze was in full force, and coaches talked endlessly about the Swiss ball, training on one leg, and performing cable chops on expensive cable machines. Some of them still do. Over the previous few years, I had run up a fair amount of debt—about $26,000—and I saw no way to open a small training space with the most popular and expensive equipment. On the other hand, I also really didn&apos;t identify with the pretty training I saw on the Internet. I was attracted to raw, intense training, where location didn&apos;t matter, and being strong and tough was the primary aim. I remembered driving by a tire yard in my old hometown countless times. The tires were enormous, and piles of them stretched past the fence that was locked up after hours. The thought of going in and doing battle against a huge tire, training like gladiators—that&apos;s what I connected with most. One day, I wandered into the office to see if the guy in charge would let me and my buddy flip some tires on a Saturday morning—just to try it out. He seemed hesitant at first, but must have sensed my passion, and let us in. Putting the "tire" in "tired"
Flipping tires is an activity that&apos;s worth your time, but even more than that, worth your respect. This tire was 400 or 500 pounds, and we took turns flipping it for 10 or 15 minutes. The two tire-yard workers watched us as they smoked cigarettes. We hesitated to admit it, but pretty quickly, we were done. That&apos;s when the guys put down their cigarettes and said they&apos;d finally show us how to flip tires. Since then, I&apos;ve flipped a lot of tires, and I&apos;ve taught a lot of people to do it as well. It&apos;s an activity that&apos;s worth your time, but even more than that, worth your respect. Here&apos;s where to start. The tire flip has become a fad exercise, unfortunately. You see coaches allowing people to flip tires using rounded backs and poor technique. The tire flip is an exercise one must earn. Now, don&apos;t let that list lead you to believe that you deadlift the tire to flip it, or that you use your biceps to curl it up. Neither approach will generate enough power to get a decent-sized tire up on its side. As I discuss in the video, a tire isn&apos;t like other weights. You have to drive through it, not lift it. Relax your biceps to avoid curling the tire. Keep your back tight to avoid rounding of the back, especially your lower back. Are you strong enough? Is your form on the three movements I listed truly up to snuff? If the answer to both is yes—be honest!—let&apos;s talk details. Tire flips are tough—and they should be tough. Let&apos;s be clear: Flips for high reps with a small or light tire are not an effective conditioning exercise. The small tire often causes people to perform a round-backed squat, and then they curl the tire up, which goes against the name of this exercise. It&apos;s a tire flip, not a tire curl. If you&apos;re looking for explosive conditioning, you&apos;re better off performing high-rep kettlebell swings. That out of the way, if you&apos;re just starting out, stick to low reps with a light tire. Start with 5 sets of 2 reps, resting about a minute after each set. Focus on speed and technique. For advanced trainees, make sure you are thoroughly warmed up before flipping a heavy tire. If all you have is a lighter tire, still keep the reps low to prioritize speed and technique. At most, perform something like a 5 x 5 protocol. The tire flip is a great exercise, but like any exercise, you must avoid overusing it. Cycle this exercise in and out of your program. If you&apos;re new to odd objects and strongman-style training, build your foundation with the three key exercises I listed above, in all their variations. The tire flip is definitely best used early in a workout, after a thorough warm-up. View it as a max-effort exercise or a main lift, because it uses your legs and back primarily—and intensely. You don&apos;t want to try a tire flip after heavily fatiguing yourself with squats and deadlifts. As for when not to use a tire flip, well, if you have any doubt in your strength or ability—either in general or as you&apos;re walking up to the tire itself—don&apos;t attempt the flip. If I haven&apos;t made it clear already, beginners have no business performing the tire flip. This exercise requires both skill and a solid foundation of strength, which is why it has been a staple in strongman competitions for decades. Earn the right to flip the tire. Then use it to help you transfer your strength into brutal full-body power!